Kormákur Jarl Gunnarson is the electronic mastermind behind Brilliantinus. 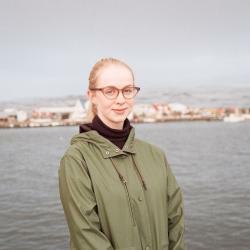 In only a year he’s become a prominent name in Reykjavík’s music scene, performing at festivals including Secret Solstice, Iceland Airwaves and Sónar. He is currently producing Kött Grá Pjé’s album, to be released later this year, and will be putting out his own solo album ‘Brilliant In Us’ later this summer. Kormákur takes his computer with him wherever he goes. That way, he can sit down and work no matter where he is. “I’ve often blamed school because I feel I never really have time to create, because of it,” he says “However, I use all of my free time, including lunch break at school, to work and if I’m in the zone I’ll keep on going and even skip class to do so.” This fall he will be able to fulfill his desire to create by studying electronic music performance and production in Berlin. Kormákur has gained much attention, performing at various festivals and collaborating with artists such as EinarIndra and Kött Grá Pjé, despite never having released an album and only publishing his work to Soundcloud. “I like keeping my music a bit underground,” Kormákur says. “I think it means I’m doing something right if I don’t have to advertise my work.” He explains that one of his favourite things about being a musician is performing in front of a crowd and getting compliments from people who’ve never heard of him before. ’Brilliant In Us’ will be released later this summer. In the meantime, make sure to catch him at the Grapevine Grassroots concert at Húrra, July 24.